Is this new company name for the new unit? The source of the official website of the new unit. The back side of XIAH Junsu solo CD jacket. There is the name CJeS, instead of SM. [INFO] Musical Mozart 4th Round Ticket Sales Starts! Please check the performance schedule before reserving. Junsu will perform on February 16th, 18th, 20th (2 segments). Though all of the members are at the backstage, a screen was used to separate them. To forbid interactions, staffs would be them to monitor each of the members. It was said that they were even unable to communicate with each other. At both of the Best Hit and FNS Music Festival held on November 26 and December 20 respectively, we were able to saw all of the members performing live on stage. However, they (TVXQ) were later said to be giving each other cold shoulders. However if the above stated was true (that they were having bad relationship), they wouldn’t be talking with each other even if a screen wasn’t there! It however shows that the strong bond between members still exists and thus, barriers were needed so to prevent communication. Despite the on-going lawsuit, the members arrived in Japan on Mid – December for the PV’s filming of their upcoming single – Break Out – said to be released on 2010. Similar to previous situation, a 3 – 2 formation was formed. 3 members stayed in hotel and flights scheduled that were different from the other 2 members. The atmosphere while filming the PV on December 15 and 16 was thus oddly tense. Why? Apart from TVXQ’s managers, there were also staffs from Koreans who arrived specifically to observe the members while filming. Not only did this occur when filming, they were also watched while taking break. This is a harsh and major blow for members whom once mentioned that they hope to perform as a group. Max Chang Min seems to be having a silent protest as he rarely spoke. Sam-san who direct for this PV, is the dance instructor and big brother for TVXQ too. While not working, SAM – san and the members would go for a drink and too and hopefully, they (TVXQ) are able to pour their sorrows and feelings to him. It must be difficult for them all to be working in a tense atmosphere. It is a difficult period for members and their fans now. The lawyer of the 3 members also expressed that the 3 members were extremely apologetic that they had made their fans upset. It wasn’t an easy decision for members to postpone the BIGEAST MEETING – one that they had been waiting eagerly – Xiah Jun Su also delayed the musical that he would be starring in so as to attend the meeting. Fans hope that though they might not be in the current management company in the future, they (TVXQ) would be able to sing and perform on stage – as one. As the New Year approaching, we hope that they will be able to BREAK OUT and pull through this crisis! Japanese media revealed that while filming the latest PV in December, members of TVXQ were being forced not to communicate with each other. SM Entertainment however responded that this is no evidence that they (SME) are monitoring the members in private. 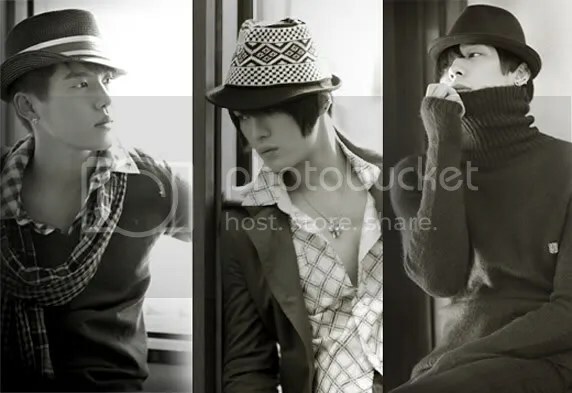 On December 22, 2009, a Japanese weekly women magazine (Women’s Self) stated that during the activities in Japan, the communication between TVXQ’s has been forbidden and monitored since 3 of the members has filed a lawsuit against SME. The magazine also wrote that during the activities in Japan, the members were unable to perform well as one. Though all of the members stayed in one room, there was a screen separating them into 3 – 2. Thus, this act seems to forbid interaction between members and to observe their actions. The same situation occurred while they were filming for the PV of their upcoming Japanese single, Break Out. Though the MV was filmed in Japan, there were staffs following them to disallow communication between members. she was one of the Cassies who moved out of the way for JaeChunSu as they left.. and she overheard the staff talking. As the three were getting off the stage..
and YoungWoong Jaejoong apparently couldn’t hold it back anymore and burst into tears..
and they said that they had never seen YoungWoong Jaejoong cry so hard before…. It hurts me to think of them in such pain…..
and the three stopped their car..
so the three stopped the car. So they could see it more, so more Cassies could stick these signs on their window. And when the van was leaving, the Cassies acted as blockades so that the three could leave safely. 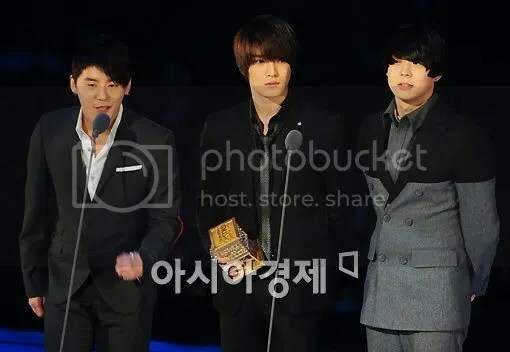 Group TVXQ’s Micky Yoochun, YoungWoong Jaejoong and Xiah Junsu received the Best Asia Star Award at the ‘Mnet Asian Music Awards’ (2009 MAMA). TVXQ was awarded the ‘Best Asia Star Award’ at the Mnet 2009 MAMA at the Seoul, Jamshil Indoor Stadium on the 21st. Okay, I hate reporters. They don’t write things down exactly. Sejong also released a hand written document of Mr. A who says he signed the note of confirmation instead. 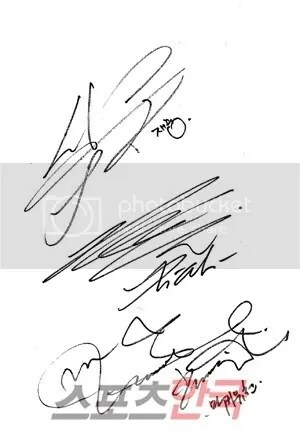 He also showed the actual signatures of Xiah Junsu, YoungWoong Jaejoong and Micky Yoochun to show that there were clear differences in the signatures. 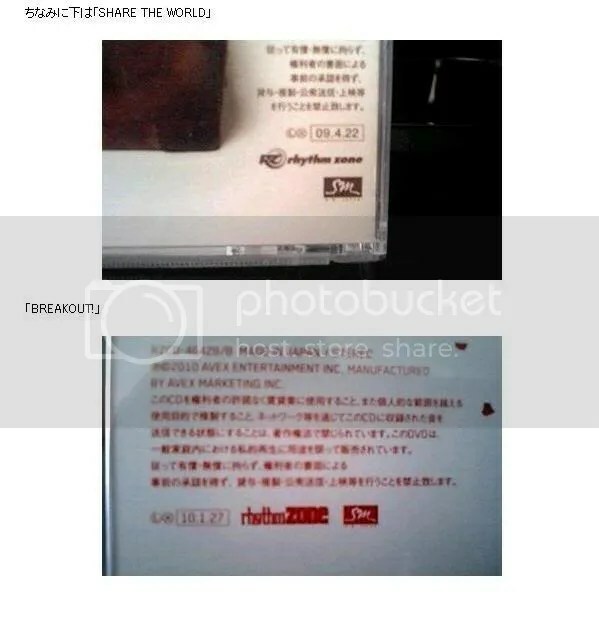 according to the hand written document, Mr. A “Signed the Shenzhen Concert note of confirmation instead of TVXQ in March.” Mr. A’s claims are to be investigated. YoungWoong Jaejoong, Micky Yoochun and Xiah Junsu will be starting their individual activities. The three TVXQ members have decided to attend cable channel Mnet’s ‘Mnet Asian Music Awards (MAMA)’ at the Seoul Janshil Indoor Gymnasium on the 21st at 7 pm. The three will be greeting fans 4 months after they filed the exclusive contracts suspension request and one month after they were granted freedom to pursue individual activities by the Courts. The Seoul District Courts partially accepted the exclusive contract suspension request submitted by YoungWoong Jaejoong, Micky Yoochun and Xiah Junsu, therefore the members are allowed to pursue celebrity related, and unrelated activities freely until the verdict of the lawsuit. However, it seems hard for all five members to perform activities together for now. Also, SM is currently boycotting ‘MAMA’ and it seems almost impossible for the five to perform together. The three members of TVXQ started their individual activities with the first Kpop awards of the end of the year ‘MAMA’ and many are wondering what they will show us next.